When I try to open this image in PS (CS5) I get red rectangles around the parts of the image that are not transparent. What is wrong with this image?! Or is it my PS? Not sure about your exact instance, but I've often encountered PNG files that open with black or another color in place of the transparency. This is typically due to the PNG file using indexed colors and having an alpha palette rather than using a full alpha mask on the image itself. Basically, when you normally save a PNG file, you're using full 24-bit truecolor (8 bits per channel) plus an alpha mask that stores the transparency info (basically another 8-bit channel). When you use palette colors, it indexes the colors as 24-bit RGB colors and keeps a separate 8-bit alpha mask. However, PNG also supports alpha palettes. This means that each of your indexed colors is stored as a 32-bit RGBA color with the transparency data embedded in the palette. This is uncommon since it's difficult to do intelligently, and unfortunately it doesn't fit in with Photoshop's color modes. So when Photoshop opens it, it only reads the RGB components of each indexed color and doesn't find an alpha mask, so all the transparency data is lost. I don't recall encountering a file where an arbitrary matte color is applied to the partially transparent regions, but this still could be a variation of the same problem. Lèse nailed it. It is indeed a PNG 8, with a truly odd palette. Here's how it opens in Fireworks, which both identifies and renders it correctly. The reason for the blockiness is apparent when you look at the table: every location but the transparent one has the same color. Anti-alias? We don't need no stinkin' anti-alias! Your question is well answered by the folk above, but I though I'd mention a course of action for those who come after - you can open the indexed png in Preview.app or pixlr.com and resave the image as a png to get lossless access to the image. You can then resave the image in whatever format with PS. I use Image Alpha and Image Optim for reliable output. Mor information in the article: “PNG that works”, which explains PNG8 format, and other PNG optimisation issues in more detail. 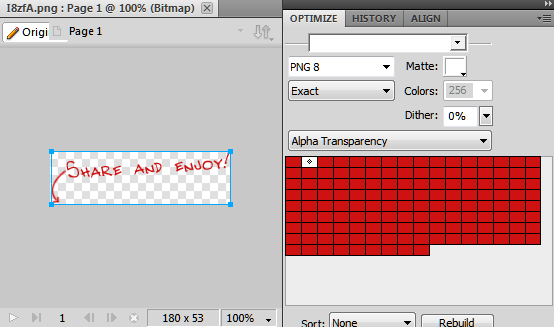 Web designers sometimes use Fireworks to save 8-bit PNG files with an alpha-transparent channel as it enables some of the older browsers to handle alpha-transparency more reliably without proprietary hacks or IE CSS filters etc. The colour profiles in Photoshop won't recognise or render this correctly though. You can usually OPEN transparent PNGs, but you can't copy/paste. Try saving it and opening it from within photoshop.